According to Flickr “favorites” these were my top five sports photos of 2016. Not all of the photos were taken in 2016; rather, these are the photos most “favorited” in 2016. The Raiders are currently tied for fourth place with two games to go. They are just one game out of second place and just one game out of sixth place! The top four team will host the first round of the Cascade Conference Playoffs which begin next week. Tonight they face Warner Pacific at 5:30 in Portland. The playoff picture will clear up after tomorrow night’s games. I spent yesterday on the sidelines of the Ducks-Utes game in Eugene. The weather wasn’t too bad. In fact, it only rained during the pregame. It was mostly cloudy the rest of the time, but I can’t complain. A day game without rain is more than I expected. I took nearly 900 photos and have only looked at about 50 at this point. I’ll post some more here soon. Yesterday Austin Dodge broke the SOU Raiders touchdown passing record by throwing eight of them. He held the prior record of six (set last season) along with the current University of Oregon coach, Mark Helfrich. Colin Amsler drops back to punt, but begins to run with the ball instead. He broke a couple near tackles in the process. … over heals for a 16-yard gain and a Raider first down. 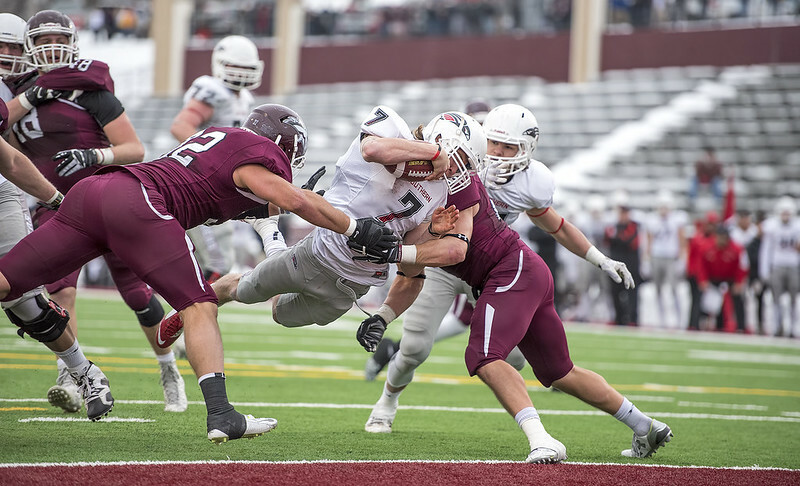 The Southern Oregon University Football Team won yesterday’s contest against Montana Tech 59-32. 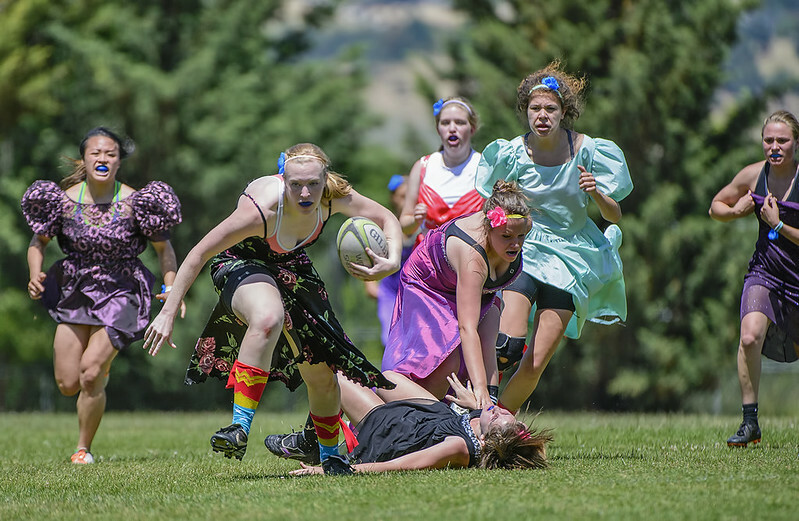 If you thought playing rugby in a prom dress would be difficult, try running in a prom dress when the grass is about six inches too long too. If you missed earlier installments of this series, you can find them all by clicking here. Mitchell Lofstedt had an incredible collegiate career at SOU. He earned the most career wins, highest winning percentage, most wins in one season, and three individual national championships. In addition, he lead the Raiders to three second-place finishes in the NAIA Team National Championships. A couple weeks ago I was asked to take photos at the first, annual 2013 Black and Red All-Sports Awards Banquet. The event worked sort of like an academy awards show with the athletes in formal dress. 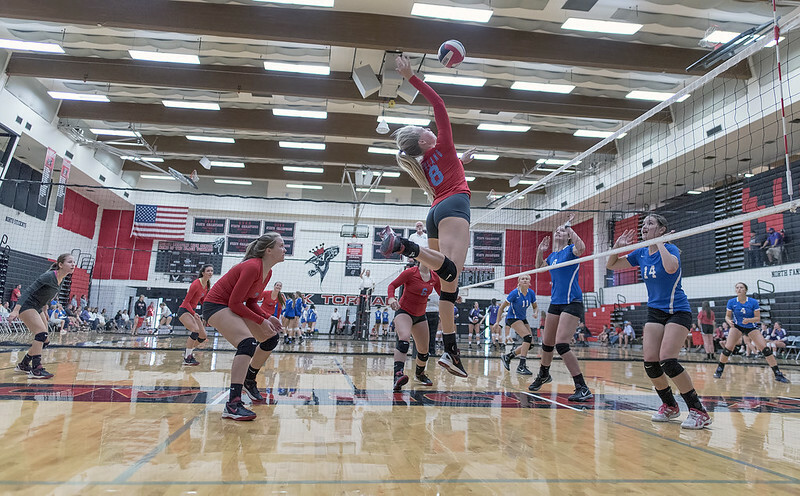 Three players from each SOU sports team were part of the voting block. There were nominees for various awards like athlete of the year for each sport, play of the year, coach of the year, etc. Today’s photo was taken after the event and includes much of the Women’s Soccer Team. The finalists for soccer athlete of the year were Alyssa Bricker and Stephanie Carr. I’ll show you the winner in a future post.